Conservation Agriculture is method of farming that is being adopted by more and more farmers across the world. Since the 1960s farmers and researchers in North and South America have been gradually refining a system of growing crops that conserves and builds-up value organic matter in soils, improves soil quality and fertility. Conservation Agriculture has also been shown to dramatically reduce some of the negative environmental impacts associated with modern-day agriculture (such air and water pollution from wind and water erosion). 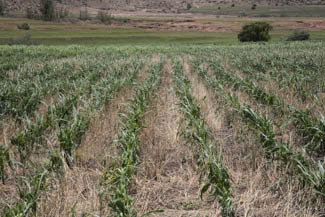 Compared with conventional agriculture which uses tillage (ploughing) as a primary method of weed control and seedbed preparation, Conservation Agriculture strives to minimize soil disturbance. Reducing soil tillage and ensuring that the soil has a vegetative or residue cover has a dramatic impact on reducing soil erosion. Reductions in soil erosion losses of up to 99 percent are not uncommon. Reducing soil erosion has an added benefit of conserving valuable top soil and plant nutrients for the next crop. Over time soil organic matter will increase leading to improvements in soil structure, water holding capacity and nutrient holding capacity. Many modern day ploughing and tillage techniques alter the natural balance of micro-organisms in the soil. Under Conservation Agriculture the natural balance is restored and the soil is better able to supply plant nutrient and water needs. Crop rotations are the other a cornerstone of conservation systems. Rotating between different types of crops helps to reduce the build up of insect pests and diseases that can build up in the soil if the same crop is grown on the same field year after year.